Everybody knows that it’s extremely important to have a functioning sewer system in the house. When a problem strikes, you have to act quickly to prevent it from getting worse! If you’re in need of residential drain services in Longview, TX, you’ll find compassionate customer care and speedy results from the experts at Ledbetter Plumbing. Take a look at some of our common residential drain services to find the solution your home needs. When a drain is clogged, Ledbetter Plumbing will perform a simple Sewer Line Cleaning to clear the troublesome area. During this procedure, we’ll run a drain snake (also known as an augur or cable) through the pipe to clear the clogged area. This basic service is one of the most commonly performed and is generally inexpensive. In most cases, when the Sewer Line Cleaning is completed your plumbing will be as good as new! Your Ledbetter Plumbing service provider can answer any of your questions before leaving you to enjoy the rest of your day! Give Me a FREE Estimate! A Video Drain Inspection is recommended when the clogging source isn’t located with an initial Sewer Line Cleaning. During a Video Drain Inspection, the Ledbetter Plumbing employee will run a video line through the main sewer line, which will help us locate and determine the specific cause of the blockage. This is extremely advantageous to our Frisco plumbing professionals, as it reduces time and costly explorative services. Instead, we’ll pinpoint the cause of the clog and get to work correcting the area. This video may not be pretty, but you’ll agree that it certainly enables us to do our job quickly and effectively. Our Hydro Jetting service lets us blast away clogs, dirt and even tree roots! Sometimes, regular occurrences like years of hair and grime buildup can create a massive blockage. In other circumstances,, tree roots can invade and breach a household’s plumbing system. When this happens, Ledbetter Plumbing turns to Hydro Jetting! This technique involves spraying large volumes of water at a high pressure (around 4,000 psi) to break down the obstacle. We’ll carefully evaluate your situation with a Video Drain Inspection to determine that your plumbing can withstand the force of the water, as well as to guide a snake to heavy obstacles, like roots, and tear them before the hydro jetting service. Then we’ll blast away your plumbing problems with hydro jetting! When all is said and done, your lines will be clear and the Ledbetter Plumbing team will be on their way. Why wait for your plumbing dilemma to worsen? 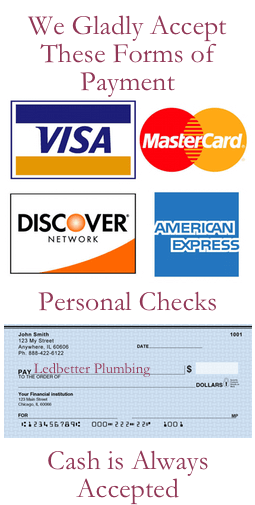 Call Ledbetter Plumbing to schedule a visit today! Our friendly team is ready to help you solve your problem with careful attention and innovative plumbing solutions. We proudly serve the residents and businesses of the Longview Tx area. We also gladly service the neighborhoods and businesses of Gladewater, Kilgore, Marshall and surrounding areas of East Texas. Please feel free to give us a call at 903-234-2088. We look forward to serving your plumbing needs!